The next podcast Scott and I talk about "How To Do Art When You Don't Have Time". It clocks in at a much longer show around the time I am aiming for of 45 minutes an episode. I also went with an Explicit rating since we sometimes curse and I figure I would not want someone to listen in with their kids and be shocked :-) We try to limit it though. I have family visiting shortly and as such I am doing some more work on the guest house so it is a little cosier. It serves as my jam shack (guitar), the Xbox room, and our home office. To that effect we have gone without window covering in the main seating area but this room has 3 large windows which look out to the driveway and the front of the main house. So you can kinda look into the guest house from the main house. Not cool (sorry Father-in-law who has visited with such a lousy offering). So, today I finally got out to Lowes to look for some blinds. I was pleasantly surprised at the choices and the fact that they can now cut the blinds to your required size, while you wait! Awesome! I have 3 windows 58 1/4 inches wide and tall. So, the 58" wide blinds would not cut it. To hang the blinds you need 1/4" clearance on both side (I am told). 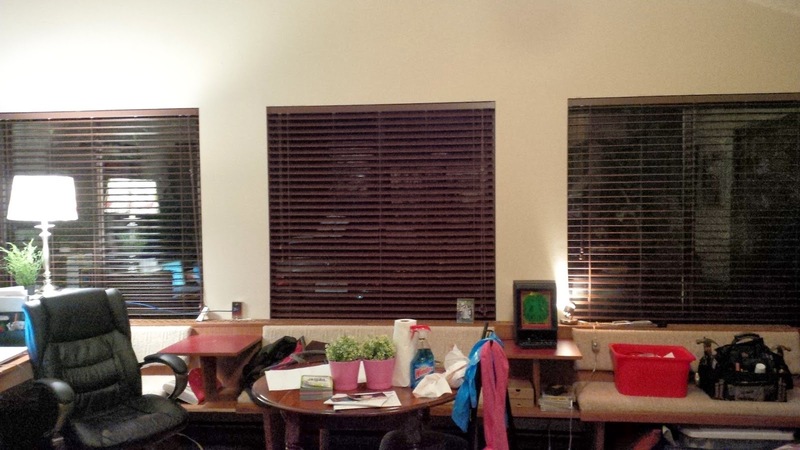 That said, there were no 58" blinds in the style I wanted so I am lucky I had to ask for help. Being a manly guy I don't want to ask for help, I figure if the size I don't need is not there then screw it, find what will fit. Ya, pigheaded. Anyways, I asked for help since I wanted the 2" wide, Walnut, Plantation style blinds to match the dark wood accents in the house. Low and behold they carried Levolor blinds (these are called Plantation style or Faux Wood which are CustomizeNow) that they can cut to your dimensions to order. As well, the machine cuts the needed 1/4" clearance off each side so you get the exact side you need, in my case that was 57 3/4 inches. The blinds were also easy to hang, though I did run into two stripped screw heads that were a pain to remove. I persevered with a fine hacksaw, vicegrips, and a lot of good old Thistle Cursing to get me through. Sometimes I hear about a movie that arouses my curiosity and I usually write it down to remember to check it out later. These are for those non-big budget movies. Now sometimes I wanna watch a check your brain at the door blockbuster. That said, there are many of these movies I don't want to watch. Some are even for series or franchises that I loved as a kid but either grew out of or the trailers look so terrible I just skip it. So, which movies have I not seen and feel strongly against enough that I never want to see them. Without further ado, here is stuff I consider trash without having even seen it. Ya, special effects. Ya, big name actors. Ya, James Cameron. I almost saw it once when friends were watching it and I said, "What is this?" The reply, "Titantic." I turned around and walked out. When I watched The Sixth Sense, on opening weekend, and about 5 minutes, ok maybe 10 minutes into it (without knowing) I said to my friends sitting next to me, so Bruce Willis is a ghost, what's the big secret in this movie that they are talking about? That pretty much sealed the deal for me and Mr. Night movies. Noone around me was happy either, note to self, shut up in packed movie theatre. Next movie was Unreakable and again, a movie that wanted to be good but was never set free from, "See, I am tricking you into thinking this is not a movie about what it is obviously about." He fooled me twice into watching his movies, not again. I keep trying to like his stuff and it is technically masterful but I am not interested. If I see his name attached now I skip it. What don't I like? It is just weird in a way that does not interest me weird. I like weird things, but not his style. Watched first 2 since my wife was into it. Hell, it had Vampires and Werewolves, what could go wrong. Oh hell! I could not bare the rest and never plan to watch them again. Ugh! Almost made it on the list and would have before my kids got into it. Would not go see it on my own and unlike those adults that loved the book but they don't read books people. I do read books and this is about as interesting as watching paint dry. Now, since having children I have read a little with my oldest. Opinion partially budged but I would never read it myself. I will relent on this series and watch it only because my kids are interested. Besides that though, I normally just read on my phone when it is on. That's all I can think of at the moment. I will append more when they come to mind. What do you dislike enough that you never plan to watch it? The kids and I enjoyed the new Mr. Peabody and Sherman movie. They liked the humour in the movie and the action packed scenes. I enjoyed the flashback to childhood watching the original show on Saturday morning cartoons and watching them enjoy the movie. There is also a Mr. Peabody and Sherman comic series ongoing, which I have been buying for the kids. We all are enjoying that one. They love having a comic to read since Dad has a bunch they can not read (due to subject matter). As for the movie, it was fun, I love time travel, and I love Mr. Peabody & Sherman. A trip down nostalgia lane and an introduction to a fun series for the boys. With anything you love, there is always more you can do to be better at it. For me, one of those passions I love to work on is guitar. I am not saying I am good, far from it, but I love playing and I enjoy working on getting better at it. One such thing I am working on is improving my hand strength on my left hand so I can do better finger work like hammer ons, flick offs, and of course more advanced chords (barre chords). Coincidentally I put heavy gauge strings on my acoustic recently for slide guitar playing. The sustain on notes and ability to generate vibrato is much better. The flip side of heavy gauge strings is that they are harder to hold down. Way harder. My playing skill has dropped with the recent change to heavy strings since I am finding it harder to hold down the chords as I play. This is a temporary setup on the road to stronger fingers and the ability to switch from chord playing with fingers to slide playing with uses less chorded notes. 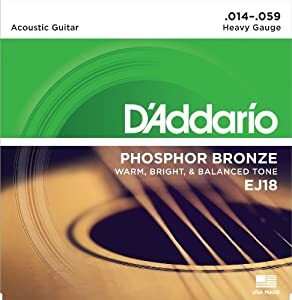 So, if you've been playing for several months on light strings and can hold your chords easily but are looking to strengthen your fingers you could try starting to move up in thickness with your strings. I would recommend moving up to medium gauge for a while before making the leap straight to heavy. 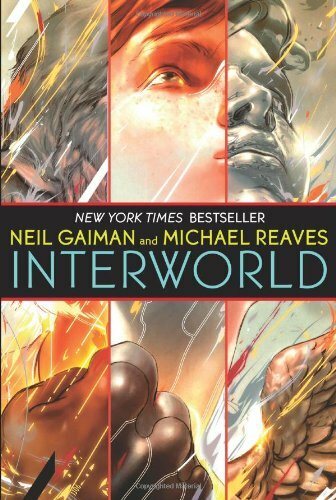 Upon recommendation from the Redmond Sci-Fi Book Club members I read Neil Gaiman and Michael Reaves Sci-Fi collaboration InterWorld. I loved this book. It was a quick read with multi-dimensional travel/time travel/magic/science/moral struggles. While reading it I felt, this feels like a screenplay. There was a lot packed into this short book and I felt a lot of areas needed more fleshing out. This was because I loved it and wanted more. When I got to the end and read the authors notes it became obvious. This was an idea they had pitched for a TV show multiple times but TV execs could not wrap their head around this interdimensional travel adventure story. So they sat down and wrote it as a novel to hand out as a way to sell the idea. So far no luck and getting a deal but I for one look forward to this being made into a TV show. The basic premise is that there are many dimensions and each has an Earth with duplicates of ourselves. A new dimension is split off whenever a major decision for someone is made. The the new world continues from that point with the other decision having been made. Now, within these split dimensional Earths there is a copy of ourselves. On each of these there is one person, named Joey, who is a Walker that can travel between dimensions. He finds out there are 2 warring fractions from 2 different dimensions that have learned to harness his copies to power their technology to travel between dimensions so they can conquer multiple dimensions. The Joeys meet, form an alliance, and begin to battle back to protect dimensions from being taken over by the 2 warring fractions, The HEX and The Binary. The HEX being ruled by Magic and The Binary by Science. Yes, it gets complex but the book does a good job of keeping it straight by explaining it is very complex and hard to keep straight. This was a fun romp that is teenager friendly and geared towards a teen TV show. I loved the multi-dimensional-time-travel aspects and the mix of science versus magic. Image: Mark Thistle, A rough draft for the shows icon. I listen to podcasts myself and over time I have listened to many. My current fav that I am catching up on is The Nerdist. Given my love of multiple topics I decided to start a podcast that is eclectic like my hobbies and tastes. One of my best friends from Newfoundland that has similar tastes and I thought would be good for a podcast with me is Scott Parsons. He agreed to try this out with me. We plan to record on Tuesday night's and so far have 2 shows done. I have been working on figuring out and getting the podcast ready. Personally I wanted to polish it more and make it perfect but then I listened to one Nerdist in particular where they discussed how creative people often want something to be perfect before exposing it. But then we can be caught up in self-doubt as we try to make it just so. So, while I figure out how to podcast you can follow along with that journey as well. Here are some things I picked up as I have been setting up the podcast. LadioCast - For pipping 2 inputs (mic and Google Hangout) into one output for Audacity so I can record my audio and the Google Hangout audio at the same time. This YouTube video and website helped me a ton to get this working easily. Editing the podcast was the next thing to learn. This is where Audacity shines again. It is simple to use and easy to apply effects to the recording to cleanup any line static, trim silence, etc. And for the love of all that is good, do not use the time shift tool unless you know what you are doing. I really messed up the first podcast using that. Hence there are a coupe of odd blips and a bunch of missing content in the first episode. I am using Blogger to blog so I decided to use it are the site for the podcast as well for now. We may decide to spin it off later but for now I tried to keep this easy. The Blerch is a construct from Matthew Inman, the Seattle based cartoonist behind The Oatmeal. Now The Oatmeal is not really kid friendly (and sometimes not adult friendly depending on your sense of humour). I do enjoy a fair deal of his work and especially The Blerch. Matthew runs long distance for a reason I know all too well. The Blerch is all the negative stuff we do to ourselves. Consider it the devil over one shoulder who occasionally whispers into our ear, "don't exercise, play video games instead," or "hey, you didn't really do much today but have that cake, you deserve it after that 1/2 lb burger and fries covered in cheese". Some people run to stay in shape, to look good, or to reach nirvana. I, as Matthew succinctly put it, run from The Blerch. Monday, March 24th, I plan to register to Beat The Blerch. The race is on September 24th, 2014 in Carnation, Washington, about 20 mins from my house. If you want to run with me and need a place to stay that weekend then let me know. I'd be happy to have you along. As well, I hope to get into the 1/2 marathon if there is space. My 5 year old had a homework assignment to make 10 words from leprechaun. He had fun with this and was amazed at how many words we could come up with. What was also fun was seeing him become comfortable with "playing" with letter order and combinations. So we have started to do this with other words. This is a fun game to get kids excited about playing with words. Give it a try. My youngest gets off school at 11:45am. My oldest gets out at 3:40pm. We have to get lunch. He gets 1-3 sheets of homework each day, that we must complete. He sometimes has work he did not complete in class that we must do. 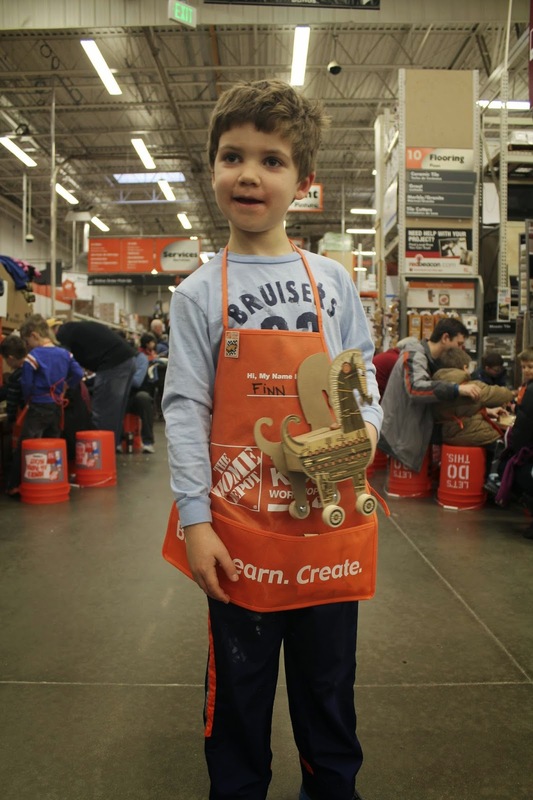 Homework can take anywhere from 30-120 minutes to complete. It only every takes a long time when he is not into it and we have breaks in between the actual work. I also let him wander from dedicated homework to other projects like colouring or Dad/Mom homework (additional worksheets/books we have). As you can guess, if I do homework with him each day that makes it hard to get a day to go swimming, head to the library, go biking, etc. That is, the funs things we want to do which take more time out of our afternoon before we have to get to school to pick up his brother. This week we are testing out doing 2 days of homework on one day and then having a day with an adventure on the "day off." The boys both loved the idea and yesterday they did 2 days of homework. Today my youngest got rewarded with swimming and a trip to the library. I also go to fit in a trip to Target for house stuff that I would have had to fit in between homework and afternoon pickup. Everyone is liking the idea so far. Tomorrow we load up again for a canoeing afternoon on the next nice day.